This is the third part of our preseason series looking at the Blackhawks’ roster heading into training camp in 2010. In the first part, we focused on the centers on the roster. Next, we looked at the wings. In this installment, we’ll investigate the blue line. 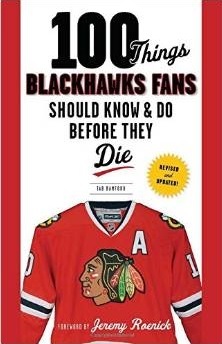 There was a great deal more discussion that needed to take place when discussing the forwards on the 2010-11 Blackhawks roster than there will be with the defensemen. While the over-dramatized summer purge saw so many contributors leave the forward rotation, the only name missing from the blue line this year will be Brent Sopel (who was dealt to Atlanta with Dustin Byfuglien and Ben Eager). 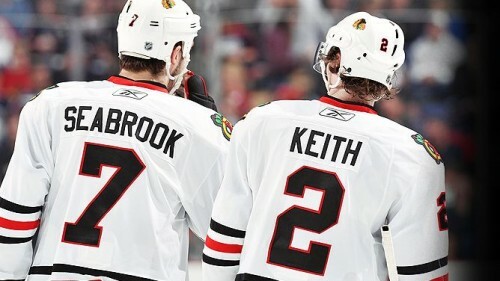 Norris Trophy winner Duncan Keith returns with Brent Seabrook as arguably the top pair in the entire NHL. Last year, Keith finished second among all defenseman with 69 points (14 G, 55 A) and had another strong plus-minus rating of +21; Keith’s +73 career rating now ranks behind only Keith Magnusson (+170) and Philip Russel (+78) in the history of Blackhawks defensemen. His 197 career points already place him tenth in the history of the Hawks among defensemen as well, and he’s just 32 behind Russel for seventh. Seabrook is far from a slouch next to him. He’s coming off a strong season that saw him miss time on two occasions because of concussions, but he still racked up 208 hits (second only to Byfuglien’s 215, but in four fewer games). Not noted as much of a scorer because he’s seen more as the physical partner of Keith, Seabrook’s 144 points are already tied for 18th in the history of the franchise. 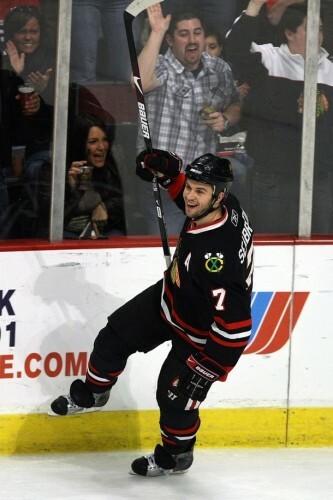 This season’s drama will again revolve around restricted free agent Seabrook. What will make these negotiations interesting is the organizational depth the Blackhawks have on their blue line. With names like Dylan Olsen, Nick Leddy, Shawn Lalonde, Ryan Stanton, Ivan Vishnevskiy and Stephen Johns in the system, the Hawks will have plenty to consider when thinking about the term of Seabrook’s contract. After all, when Keith received his long-term deal during last season, Leddy, Vishnevskiy and Johns weren’t part of the organization. The drama this summer had to do with departures, and on the blue line the Hawks were forced to make a move by one of the great defensemen in the team’s history, Doug Wilson. Now the General Manager in San Jose, Wilson gave Niklas Hjalmarsson an offer sheet in early July that shocked the Blackhawks and forced them to match a four-year deal with a cap number, $3.5M, that is probably higher than the Hawks anticipated paying the 23-year-old. Hjalmarsson has continued to develop into a fabulous, physical, intelligent defenseman. 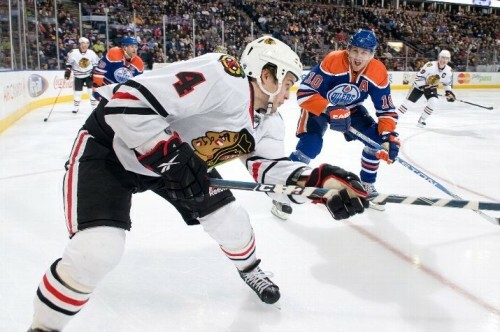 He finished last year with 137 blocked shots, third on the team behind only Seabrook (153) and Keith (143). All three were among the top 35 shot-blockers in the league last year, and the team’s willingness to put their bodies between a shooter and the goal translated into the Hawks leading the NHL with the fewest shots on goal allowed last year (25.1 per game). The Blackhawks will skate into the 2010-11 season with their top two pairs or Keith-Seabrook and Hjalmarsson-Brian Campbell intact. However, considering the talented youngsters matriculating through the system that can move the puck well, it would not be surprising if the Hawks began shopping Campbell this year. That isn’t to say that Campbell isn’t valuable to this team. But the skills he brings to the ice could be valuable to another team, and he’s still young enough (31) that he could be a factor for a competing team down the stretch. His 38 points (7 G, 31 A) in an injury-shortened 68 games were still good enough to rank among the top 30 defensemen in the league last year, but his salary cap number being over $7M will become an achilles’ heel for the Hawks moving forward. On the third pair this year there will probably be three or four names in the mix. Jordan Hendry and Nick Boynton are under one-year contracts, and both saw significant action in the playoffs. However, expecting either/both of them to skate 82 games would be inappropriate. This is where some of the more significant intrigue in training camp may be born. John Scott, listed at 6’8 and 260 pounds, was brought in to provide muscle and size. He has played both at a forward spot and the blue line in his career, and his punishing wingspan and willingness to drop the gloves will likely be seen as the replacement for Ben Eager. However, he isn’t a very good skater and his hands are suspect; how he fits into the Hawks rotation for more than protection is a question mark. The other names to watch are the kids. Vishnevskiy probably has the best shot to crack the NHL roster among a group including Leddy, Lalonde, Stanton and Brian Connelly because he has NHL experience. He’s a fluid skater who handles the puck well and can carry it out of the zone on his own effectively, making him a strong candidate to see time at the point on the power play in a secondary role. Because he’s 22 (and Leddy’s just 19), he could get a shot out of camp to provide a puck moving presence to the roster at the bottom of the rotation. The development of Vishnevskiy and Leddy will be directly tied to the Blackhawks ability and willingness to move Campbell. Overall, the Blackhawks will enter next year with an exceptional group that could be as deep as any group in the NHL again. Joel Quenneville won’t have as much head scratching with this group as he will up front, which should help him sleep a little better between now and the beginning of the season.